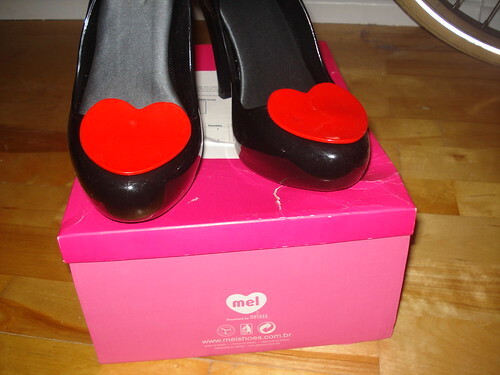 t*rexes and tiaras: Sunday Shoes 032: Mel Raspberry Heart heels.. It's taken me a really long time to bite the bullet and order a pair of these. Having seen them in so many blog posts and every time I've been in Office over the past year or so, I've been pretty intrigued by them. My main reservation was the fact that they are made from rubber - I was worried that they wouldn't be comfortable at all. It's the same reason I've never taken the plunge for a pair of Lady V's, either. The thought of rubber shoes just makes me think "blisters". But, when I saw that this pair were reduced, and after hearing many people say how good and comfortable they are, I decided to give them a try. I've been quite pleasantly surprised, to be honest. The rubber around the upper of the shoe is soft and comfortable around the foot, but the base and the heel are strong enough that the shoes feel totally stable, which had been another wonder of mine. 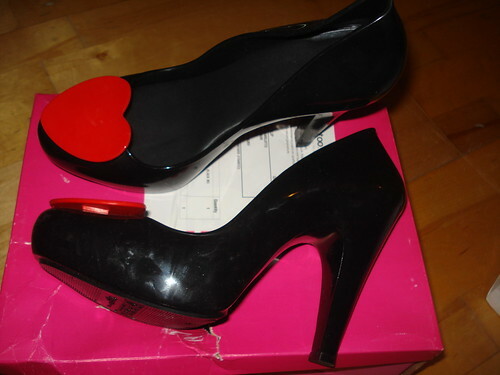 The black surface seems hard to photograph, it seems to pick up fingerprint marks very easily, but I love the shiny finish of the red heart, which seems really securely fixed to the shoe. The height is definitely high enough for me; heel height is often something which puts me off a pair of shoes, as I'm quite fussy about avoiding low or kitten heels. I'd definitely recommend these and now that I've finally got a pair, am wondering why it took me so long! Ah I saw these in the sale too! They are so lovely, I'm on a spending ban else I would have snapped them up straight away! They're beautiful! 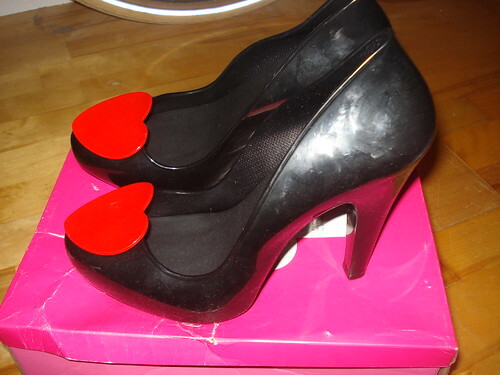 If I could walk in heels I would totally be hitting the checkout button on these! Oh wow, be still my beating heart. I wish I could actually walk in heels! Cute! Yeah they are much sturdier than you imagine, even my very strappy Jean Paul Gaultier/Melissa pair seem pretty robust. They do pick up fingerprints very easily, I've noticed that with some of my VW's!